OcNOS is a robust, programmable and innovative operating system, featuring a single software image that runs across the entire portfolio of Open Compute platforms from leading network device vendors. This guarantees consistent operations, workflow automation and high availability, while significantly reducing operational expenses. OcNOS borrows heavily from the popular ZebOS line of products, which provides a rich feature density and robustness that has been built up over the years and validated in thousands of diverse customer networks. OcNOS provides industry standard CLI, supports all standard MIBs and other standard operation and management tools. Its integrated centralized management and provisioning layer allows for transaction-based configuration and device feature modelling. The management layer has support for Netconf, REST APIs besides custom CLI generation capability. This allows an OcNOS system to be configured, managed and controlled by Network Management System for scaled topologies and in multiple ways. OcNOS is a modular, multi-tasking network operating system, with tight integration capabilities on commodity hardware. This design allows for scaled and performance critical deployments. The niche coupling with merchant silicon utilizes key hardware capabilities for better performance and feature set. OcNOS is designed using several abstraction layers. The hardware abstraction layer, allows the OcNOS software to run over multiple control plane CPU and forwarding chipset hardware. The system calls are also well abstracted allowing to switch across operating systems if required. It has been integrated and verified with multiple commodity hardware, which again allows seamless portability across diverse network hardware. OcNOS solution is built using open networking standards, as well as popular vendor specific extensions for device management. The operation and management is provided using CLI and SNMP which is built on top a fully transactional management plane. This allows the OcNOS-based network node to be easy to operate and interoperate with another vendor node. 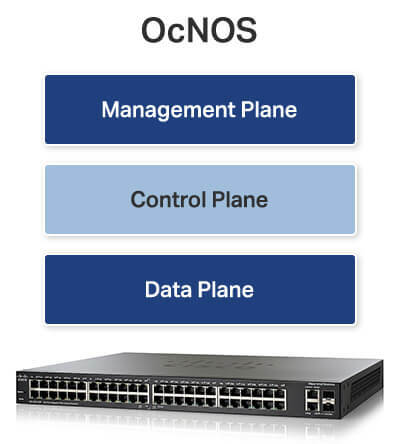 The OcNOS management plane can support a wide variety of management interfaces like CLI, SNMP, REST, NETCONF, SAF IMM-OI and any future or custom north bound management interface. OcNOS supports technologies required for bandwidth scaling at data centers and interconnects. The OcNOS centralized transaction based managed object modeling layer allows for multiple management interfaces. This, in turn, allows for a central service level provisioning and chaining across multiple devices. OcNOS infrastructure is SDN and NFV ready. The control plane and data plane has support for SDN support through OpenFlow. The SMI based C APIs provides end users the ability to write user defined functions to program the network control and data plane to provide custom programmable network operations. OcNOS provides standards based redundancy protocols like VRRP, BFD, ring failure recovery protocols, MLAG, UDLD and graceful restart mechanisms. This protocol level redundancy provides guaranteed network level redundancy. For device level redundancy, OcNOS supports service availability frameworks based master-slave hot standby syncing. This feature is supported for several key protocols allowing device level redundancy in the absence of peer level network support. The modularity of OcNOS allows for individual process/protocol level upgrades and restarts without disturbing the running system for easy software upgrades. OcNOS will support ISSU for stateless upgrades. OcNOS has an in-built process heart beat monitoring and restart feature for process survivability in a 1 rack unit or multi-chassis format. This architecture helps in minimizing downtime in mission-critical network deployments. 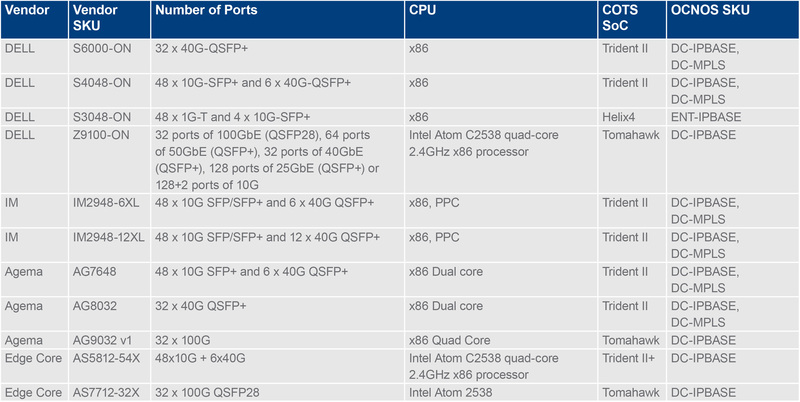 IP Infusion’s Open Compute Operating System (OcNOS) has been designed from the ground-up and is optimized to address the needs of public/private/hybrid cloud networks, while enabling new applications and ushering in the era of Software Defined Networks (SDN), newer, demanding data center and enterprise network environments. It is the industry’s most advanced network operating system for open compute platforms. Combining modern-day software and operating system (O/S) concepts, transparently restartable processes, open platform development, an un-modified Linux kernel, and a stateful database model. * This feature list includes features from our current roadmap. Please refer to the OcNOS data sheet for the complete listing of features that are currently available. The OcNOS™ Product Brief contains a product overview, system architecture, and a comprehensive list of features and benefits, detailing its common software for multiple deployments and hardware, modular software design, support of disruptive networking technologies, and high availability. The OcNOS™ Data Sheet provides a product overview and detailed list of features including System Level, Layer 2, Layer 3, MPLS, Management, Security, and QoS features. The OcNOS™ 1.3.4 Product Bulletin describes the features with the OcNOS™ 1.3.4 software release, including features for system level, Layer 2, Layer 3, Multicast, MPLS, Management and QoS. This OcNOS™ Applications Note highlights the OcNOS™ features and license categories; installing OcNOS™ on the switch; basic configuration and verification; license file and software updates; peripheral devices and compatibility.